The current church rests on the foundations of two earlier ones, that of a small 12th century Crusader chapel abandoned in 1345, and a 4th century Byzantinebasilica, destroyed by an earthquake in 746. In 1920, during work on the foundations, a column was found two meters beneath the floor of the medieval crusader chapel. Fragments of a magnificent mosaic were also found. Following this discovery the architect immediately removed the new foundations and began excavations of the earlier church. After the remains of the Byzantine era church were fully excavated plans for the new church were altered and work continued on the current basilica from April 19, 1922 until June, 1924 when it was consecrated. The chapel was built between 1919 and 1924 using funds donated from many different countries. The respective coat-of-arms of each donating country are incorporated into the glass of the ceiling, each in a separate, small dome, and also into the interior mosaics. The countries honored in this way are; starting from the left side, beginning with the apse: Argentina, Brazil, Chile and Mexico; in the middle of the church are commemorated: Italy, France, Spain and the United Kingdom, and to the right: Belgium, Canada, Germany, and the United States of America. 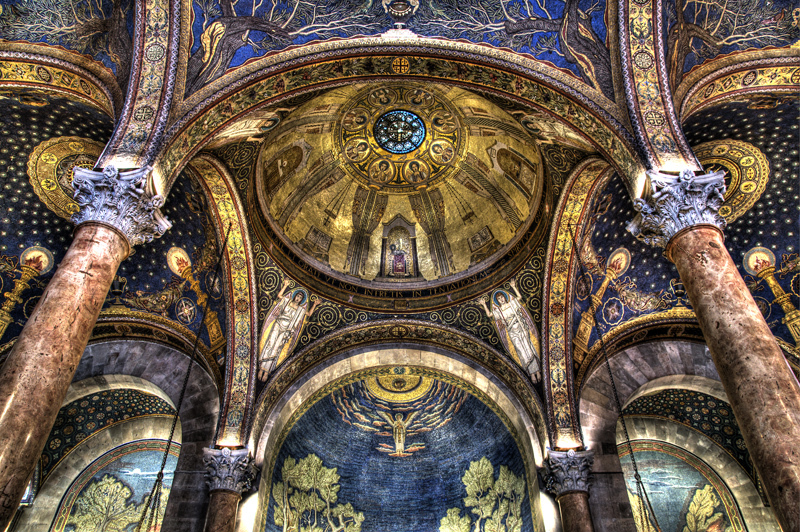 The mosaics in the apses were donated by Ireland, Hungary, and Poland. The crown around the bedrock itself was a gift of Australia. These multi-national donations give the church its present title as the Church of “All Nations”.